Make Caramel Corn in your Whirley Pop™! FRESH WARM CARAMEL CORN is a special treat that in the past has been a multi-stepped recipe taking over 1 hour for each batch. Use your regular amount of corn and popping oil. (Don't use salt). Use a measure of GLAZE POP equal to 1/2 the quantity of popcorn. 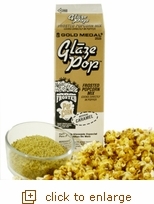 (If you use half a cup of popcorn use one forth cup of GLAZE POP). Put the oil in the popper first and as soon as it liquefies add the popcorn and GLAZE POP. Keep stirring until the popping slows down (do not wait until the last kernel pops) and dump Caramel Corn promptly. Allow to cool before eating.